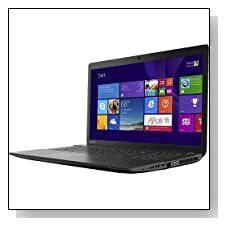 Toshiba Satellite C75D-B7300 is a large 17.3 inch HD+ screen laptop PC offering good day-to-day and surprising gaming and multimedia performance- video rendering with a quad core AMD A8 processor and Radeon R5 graphics card, decent amounts of memory for multitasking and spacious storage, an optical drive and a wide range of connectivity options and a solid feeling case- build quality with a mid range hardware. Naturally it comes with a couple of flaws like anything such has Windows 8.1 operating system and not the best speakers but sure is a nice computer overall for the price that many customers seem to be satisfied with, for what it is: Low cost and comfy home and office computing. Toshiba Satellite has the mid-tier quad core AMD A8-6410 processor (2 MB L2 cache) at 2.0GHz speed- up to 2.4GHz with turbo function that is powerful enough to handle the daily work like web browsing, Word and Excel, video watching and some gaming, 6GB of RAM that will let you do a few things at the same time without glitches or problems, 750 GB hard drive at 5400rpm rotating speed that is about 50% more than what most computers at this level would have and the 64-bit Windows 8.1 operating system so you will be experiencing fast and reliable performance on a daily basis but it is not Toshiba’s best performing computer or the one with the top of the range features but going through all the customer and expert reviews on different websites, power or speed is at satisfactory levels for most people. 17.3 inch LED-backlit TFT HD+ widescreen TruBrite display with 1600 x 900 pixel max screen resolution with AMD Radeon R5 graphics offers media with life-like details and sharpness- so the picture is great but not so much the sound although it is DTS with surround sound speakers. It is reported to be a bit low and you may need to use external speakers when you’re at home or office and headset when out and about. Gaming performance is better than what most people would expect, this computer offers great low end gaming as it is able to play older titles fluently at reasonable settings and even some 3D gaming at lower resolutions, can be used for occasional photo and video editing as well but just do not expect something like Intel i5 or i7 with a high end discrete graphics card. You have the HDMI output if you want to watch movies or play games on even a larger screen- your HDTV or other HD screen of your choice. It comes with an 720p HD webcam with built-in microphone to chat with family and friends on Skype or videoconferencing. Textured-resin finish jet black Toshiba Satellite looks nice and stylish but is a bit bulky being a 17.3 inch screen computer: It weighs 5.9 pounds with dimensions of 10.60 x 16.30 x 1.30 inches- not designed for super portability but more as a desktop replacement PC with some degree of portability, yet still not very heavy despite the screen size. Keyboard is not backlit and has fairly comfortable keys (not the best according to some customers- shallow key travel but adequate), 10 key numbed for easy number crunching and a touchpad to use with windows 8.1 functions but again you may feel more comfortable with a wireless mouse. Battery life is around 4.5 to 5 hours in normal use on a single charge from its 6-cell lithium ion battery and as this is not the most portable PC, you will be often close to power outlets. It comes with a wide range of connectivity options for an average consumer to get the daily job done, including a Multiformat DVD±RW/CD-RW Drive, 802.11b/g/n WLAN wireless, 10/100 Ethernet LAN with RJ-45 connectivity, 2 x USB 2.0 ports, a USB 3.0 port, an HDMI port and a VGA port for video output to HDTVs and monitors, a Multi-in-one Media Card Reader that supports SD, SDHC, SDXC, microSD, miniSD and MMC formats, 1 x microphone input, 1 x headphone output and a Security cable lock slot. Conclusion: Toshiba Satellite C75D-B7300 is a nice large HD+ screen laptop with mid-range hardware and low end price. You have nothing to worry about in terms of power and performance for handling daily tasks and some multimedia and gaming with its quad core AMD A8 CPU, 6GB RAM and Radeon R5 graphics card. As small cons, keyboard is non-backlit and touchpad is not the best (and you may want to get a mouse) and speakers are not very loud (external speakers will do the trick). 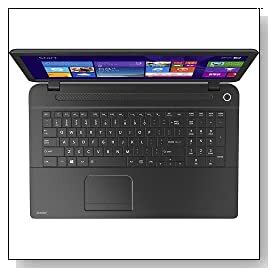 Overall it is a great value for dollar laptop and you will see how well it performs once you set it up- get it up and running and how clear the screen is- picture quality is good! Windows 8.1 is the operating system and although it comes with additional useful functions that are similar to Windows 7, it is still criticised by many customers and this is not laptop’s fault as it is the OS you will find on most new PCs these days. One of the customers mentioned that they were able to play World of Warcraft at high settings and some of the latest games at lower and the gaming performance is something most customers would not expect when they are buying a budget PC. So if you are on a budget and your priorities are the large screen with good picture quality, speed and performance, large memory and hard drive, a wide range of connectivity options including DVD drive and HDMI port, this Satellite would be a good one to consider for sure. © 2019 computercritique.com. All rights reserved.